Steven (Chicagoland, United States) on 20 May 2011 in Plant & Nature and Portfolio. The reflecting pool seen as you enter the Garfield Park Conservatory in Chicago, Illinois. The Garfield Park Conservatory is one of the largest and most stunning conservatories in the nation. Often referred to as "landscape art under glass," the Garfield Park Conservatory occupies approximately 4.5 acres inside and out, and includes cold frames and propagating where thousands of plants are grown each year for displays in City parks and spaces. 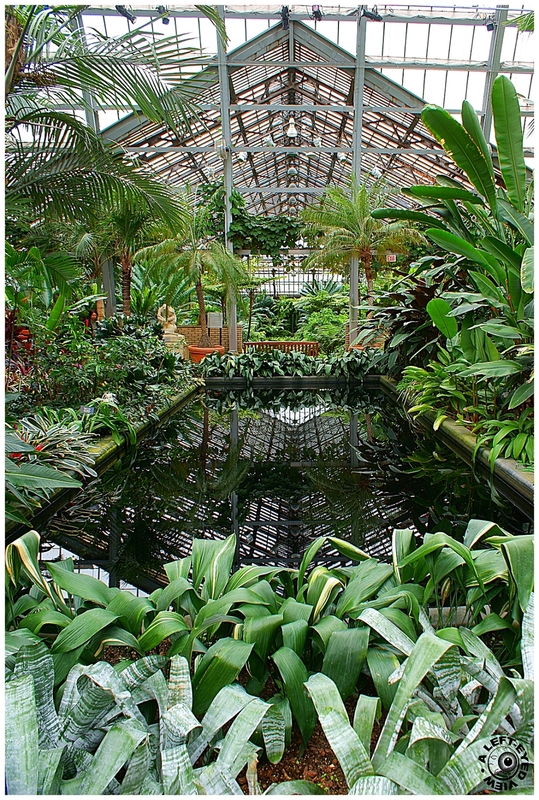 Garfield Park Conservatory is located in Garfield Park — a 184-acre site located on Chicago's redeveloping Westside designed as a pleasure ground by William LeBaron Jenney — and is the oldest of the three great original Westside parks (Humboldt, Garfield, and Douglas). Photo captured May 3, 2011. I've been shouting for years that we need one of these in South Shields.looks like I'll be sending a few folks here to take a look Steven. Nice scene, great details everywhere. Wonderful image, Steven - love the textures and detail in the frame. Nicely done and a peaceful scene. Beautiful composition and HDR. The foliage in there is beautiful and perfect framing! Wow, what a beautiful conservatory - I so wish we had one nearby. You captured it wonderfully - well done! I like the contrast between structure and organic forms - great shot! Fabulous shot. It almost has my allergies going. A great shot with wonderful depth and clarity. Reminds me of my beloved Allan Gardens Conservatory, just across the way from where I live downtown here... a place that I love to wander through a few times a year, especially when the snow is flying and I need to look at tropical foliage! An elegant image and place. The reflections are wonderful. Oh my - what a marvel this is! Just spectacularly detailed and yet it all blends and is such delight to look around - I could spend hours on this cene I think, just staring at it! Wonderful blend of stuctural and natural elements working in a very beautiful symphony. This is just awesome! Very beautiful! An instant favourite! a very impressive scenery and perfekt framed! i love all these green tones and shades!